DORAL, Fla. -- Saturday was a big day for Swedish golfer Jesper Parnevik. He turned 50, meaning he could now compete on the Champions Tour. He spent some time on Twitter thanking everyone for their well wishes. The tweet was in Swedish, as was his whispering, giggling play-by-play of Mia. Even Lee Westwood took time to tweet Parnevik before teeing off for his final round at the WGC-Cadillac Championship. Jesper also responded to tweets (including mine) a few minutes later. But don't worry, this story has a happy ending. If I were Parnevik, I'd make sure to fall asleep after my wife and wake up before her for a while. She's pretty funny, too, and we all know what payback can be! PALM BEACH GARDENS, Fla. -- "Anything left here is fine." Those were the last words of instruction caddie Rickey Elliott gave to his player, Brooks Koepka, in the fairway on the par-5 18th hole Friday at the Honda Classic. As soon as Koepka made contact, it was clear his golf ball was heading toward the grandstands, well left of the putting surface. Spectators ducked and covered their heads. The golf ball careened off the stands. Everyone looked up watching as the ball shot above them and hit the roof of the structure. They waited, looked and held their breath, but the ball never came back down -- at least not on the side of the chalets where the green is. Standing behind the putting surface everyone watched as Koepka walked under the rope and out through a public access tunnel followed by his caddie. "Is he quitting?" asked a police officer standing behind the green. It's then that people realized the golf ball had rolled over the roof and was on the practice green side of the tent. Walking up to where the ball was, Koepka looked at me and said, "Mikey, you got a yardage from here?" "Yeah of course!" I said. "That's why caddies get out and walk the course on Mondays for this specific reason. If your caddie has a yardage from here ... "
That made Koepka and Elliott laugh. "I'd really love to play this. Like Phil remember?" Koepka said. "Yeah, but this is harder cause Phil could see and had a perfect lie," I said. "I wonder how they're going to tell the rules official where to find me?" Koepka replied. That brought out even more laughter and two minutes later an extremely confused looking PGA Tour rules official Robbie Ware appeared. They left the caddie standing there guarding the golf ball while trying to figure out where on the other side of the huge tent to make the drop. About five minutes went by and then a man ran over yelling at Elliott to bring the bag as they took a drop. "Mike, I'll mark the ball, will you watch the spot just in case?" he asked me. "You got it," I said, forgetting that meant I might miss the third shot. After about two minutes, I walked through a tunnel behind the green just in time to see Koepka lining up what I hope is a birdie putt. From 22 feet away the ball rolled dead center and the crowd erupted. Playing competitors Rory McIlroy and Dustin Johnson both shook their heads smiling and laughing as Koepka took off his cap, bowing to the crowd at the most improbable birdie of the year so far on the PGA Tour. There are 23 teams ahead of San Diego State in the latest GolfWeek rankings, but the Aztecs are No. 1 -- at least this week -- when it comes to golf trick shots. Golf is an individual sport, but this was truly a team effort. Manan Vatsyayana/AFP/Getty Images Irish golfer Peter Lawrie is currently 726th in the Official World Golf Rankings. Golfer Peter Lawrie says his form has gone flat because he is trying to shake off a fizzy drinks addiction. Lawrie, 40, claimed in an interview with Irish radio station Newstalk he was drinking several litres of cola a day and had a near breakdown when he tried to quit. Calling on his buddies to start cheering as he got ready to tee off, a la Adam Sandler's character in the movie "Happy Gilmore," Washington Nationals outfielder Bryce Harper showed off an impressive golf swing in an Instagram video posted Saturday afternoon. Apparently a solid golf swing comes naturally to the 22-year-old Harper, who has blasted 55 career home runs in three seasons in the major leagues. SAN DIEGO -- Ian Poulter picked the wrong place to park at dinner and wound up getting his courtesy car towed. Poulter and caddie Terry Mundy went to a Korean-barbecue restaurant Friday night during the Farmers Insurance Open, and when they left the restaurant, Poulter first thought that his courtesy car had been stolen. "There were 60 spots in the car park. We walked 40 yards to a restaurant, but apparently that restaurant that we ate in wasn't quite in the vicinity of where I should have parked," Poulter said Saturday after moving within three shots of the lead at Torrey Pines. "The kind security guard who was standing by my car as I parked waited until I left and then called a tow truck to tow it away so he could make some money. "I told him my car had been stolen," Poulter added. "He said, 'Nope, we towed it away.' I said, 'That was awfully nice of you.' A few similar words." His night wasn't over. Poulter was given a slip of paper with information how to retrieve the car. But because it wasn't his car, he couldn't claim it. "Obviously, we sign a nice piece of paper in the office that says we drive the car for the week, so I've got no documents that says this is my vehicle," he said. "I had to leave it there and get a taxi. Uber to the rescue." Poulter said he turned over the towing information to the tournament office, which took it from there. "It was brilliant, because my caddie told me to park there," Poulter said. That apparently wasn't the only car incident Friday night. Steve Wheatcroft said on Twitter he was rear-ended driving to dinner in Del Mar. Hunter Mahan's wife gave birth to a son on Friday, and this time the 32-year-old PGA Tour player didn't have to forego a chance at a victory to be there for the big moment. "Kandi and I are thrilled to have welcomed our beautiful boy, Miller Myles Mahan, 7lbs 5oz, into the world yesterday afternoon in Dallas," the couple said in a statement released by the PGA Tour. "Mom and son are doing great, and we could not be more excited to introduce our daughter, Zoe, to her new baby brother." 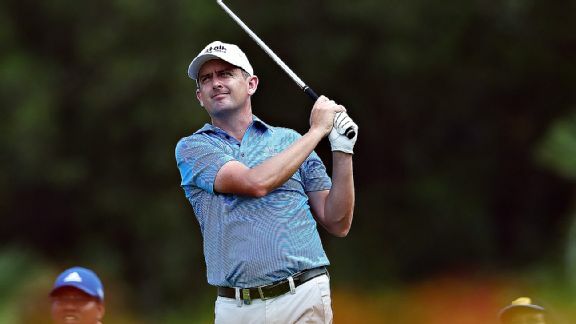 When Mahan's first child, Zoe, was born in 2013, he famously walked off the driving range at the RBC Canadian after getting a call that his wife was going into labor. The six-time PGA Tour winner left despite being the 36-hole leader after shooting scores of 67 and 64 in the first two rounds. In his most recent PGA Tour start, the 32-year-old California native finished tied for 30th last week at the Waste Management Phoenix Open. He's currently 25th in the world rankings. SCOTTSDALE, Ariz. -- Since the PGA Tour decided (smartly) to loosen the "we don't want players throwing stuff into the crowd" edict at TPC Scottsdale's 16th hole this week, Ryan Palmer is making a play at becoming the most popular golfer at the event. At least, it's pretty certain he'll be the most popular guy playing the 16th hole for at least a couple of days. On Wednesday, he shared his plan during the pro-am. "I'm putting a few of these in my bag Thursday and Saturday," Palmer slyly whispered as he rolled a $10 bill and wrapped it around a signed golf ball. "Tweet it out in the morning to get everyone going. Then you can come watch me do it," he said via text after the photos were taken. Palmer's tee time Thursday is 2:43 p.m. ET and he starts on the 10th hole, meaning he should get to the 16th right before 3 p.m. local time. Or, right when most of the bleacher fans need a refill! SCOTTSDALE, Ariz. -- David Wood's golf dream came true Wednesday. If you were going to make your first hole-in-one, could you think of anywhere better than the 16th hole during the pro-am of the Waste Management Phoenix Open at TPC Scottsdale in front of 12,000 fans? Majors don't have pro-ams, so you can stop typing the Masters. Playing with PGA Tour pro Kevin Na, Wood pulled out a pitching wedge on the 147-yard, par-3. With a smooth swing, the ball started a high majestic arc right of the hole, falling left from the sky. After hitting the green with a little side spin, the ball started tracking toward the hole as a crescendo came from the crowd in the bleachers at the green. As the ball hit the pin and disappeared, there was a pause of silence for a split second as the crowd inhaled. Then an eruption came -- first at the green, then on the tee box -- as people realized what had happened. The look of pure joy and surprise on Wood's face was one normally reserved for children opening Christmas presents. High-fives with strangers and hugs from teammates kept the crowd in a full frenzy for minutes afterward. Former NFL Chicago Bears linebacker Brian Urlacher, playing in the group behind Wood, came thru the tunnel separating the 15th green and the 16th tee asking, "What just happened? What just happened?" The good news for Wood is that his first hole-in-one was caught on camera and he'll have that memory for the rest of his life. As Na's caddie Kenny Harms yelled, "I hope you got $50,000 on you" because a round of drinks for 12,000 of your new best friends is going to be expensive. What the heck, you only make your first hole-in-one once, right? 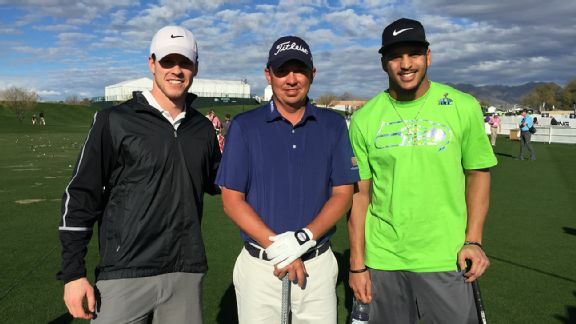 Michael Collins/ESPN PGA Tour pro Jason Dufner, center, chatted it up with Seattle Seahawks wide receivers Bryan Walters, left, and Jermaine Kearse, right, on Tuesday at the Waste Management Phoenix Open. SCOTTSDALE, Ariz. -- Standing on the driving range Tuesday at the Waste Management Phoenix Open, a couple guys looked a little out of place. One was dressed in what looked like sweatpants and a T-shirt, while the other was in shorts and a rain jacket. If you've been on tour long enough, you can tell when someone isn't a pro golfer. Turns out Seattle Seahawks players Jermaine Kearse and Bryan Walters had some time off before their big game, Super Bowl XLIX, down the road in Glendale, Arizona. Both are golf nuts -- Kearse just recently, and Walters since childhood. They walked around in awe, shaking hands and meeting golfers. Jason Dufner was a big hit. Then a tour representative asked if they'd like to hit some shots on the range. What golfer in his right mind could say no to that? Two hybrids were brought over, wallets and credentials were laid on the ground, and the swings began. Walters hit some good shots right away, while Kearse struggled. The funny thing was, on a range of PGA Tour pros, not one came over to offer swing tips. Then PGA Tour's Amanda Balionis got PGA Tour player Brendan Steele, who was with his swing coach, Rick Smith. "Brendan says to me, 'Last time I gave a guy a lesson, he quit the game two holes later and vowed never to play again,'" Smith said. "I ain't doing that again. You're the teacher!" Next thing you knew, two guys playing for the defending champion team this Sunday in the Super Bowl were getting a golf lesson from one of the top teachers in the country. All three were in absolute heaven. Smith was showing swing planes while giving nuggets of advice, encouragement, and praise. Kearse and Walters were doing something to take their minds off the big game, and they were hitting pretty good shots by the end of the 10-minute session. Afterward, everyone walked away thinking the same thing: Did that just happen? Yep, and I tweeted the pictures to prove it. Michael Collins has been writing for ESPN.com since yesterday. He started out as a stand-up comedian and fell into PGA Tour golf and caddying completely by accident in 1998. He started looping for fun in 1999 but by 2003 had decided to make it a full-time gig. He won the Nationwide Tour Championship with Chris Couch in 2003 and was on the bag for Kevin Streelman when they captured the inaugural Kodak Challenge in 2009. Michael has never won an award for his writing, probably because he failed high school English and still types with his index fingers. But he's smart, funny and, most importantly, knows the game/players/caddies and what they go through on a week-to-week basis and brings a caddie perspective that's different than anything you've ever seen when it comes to golf coverage. Bob Harig is a golf writer for ESPN.com and has been covering the game for more than 20 years, first at the St. Petersburg Times and for the last four years at ESPN.com. He began contributing to ESPN.com in 1997. Harig is a native of Barrington, Illinois, where he got his first exposure to golf as a caddie at Inverness Golf Club, where he earned an Evans Scholarship to attend Indiana University. He graduated with degrees in journalism and history. Kevin Maguire is the senior golf editor for ESPN.com and covered his first PGA Tour event in 1994 while at American University in Washington, D.C. He played collegiately for the Eagles and graduated with a degree in print journalism. Maguire grew up in the Philadelphia area and now resides outside of Hartford, Connecticut. He has been with ESPN since February 2007 and can be reached at Kevin.Maguire@espn.com.